From time to time it is refreshing to escape from the surface of the museum walls and get immersed in a different format and dimension. Diana Thater’s video installation takes our senses and imagination to a faraway land, in Kenya, where a story about our changing world develops and makes us question our role in it. Using a phrase of the artist, it is an experience that lays somewhere “between science and magic”. Diana Thater, A Runaway World, 2016-2017. Video installation Dimensions variable. Installation view, The Mistake Room, Los Angeles. Photo Credit: Fredrik Nilsen © Diana Thater and The Mistake Room Inc. 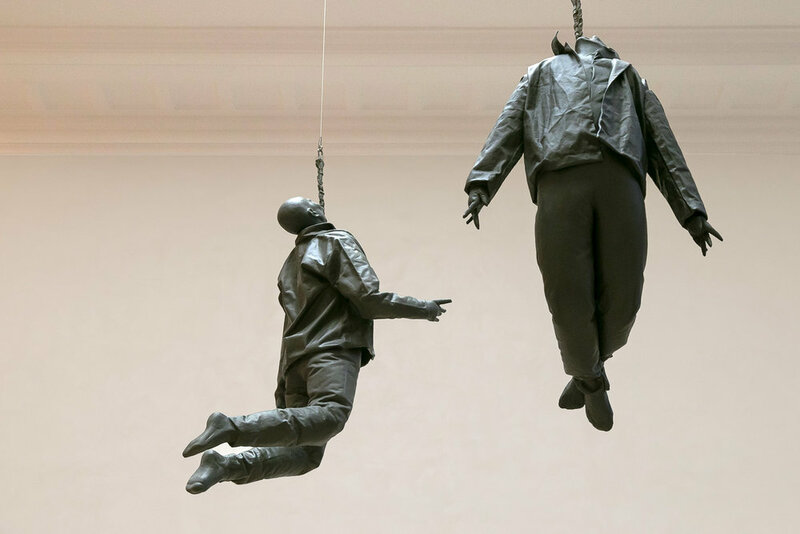 Hanging Figures is a guest artwork that can be a suggestive starting point of a visit to the museum. What I find in Juan Muñoz’s sculptures is a careful ambiguity in his representation. His figures, and particularly their faces, are both familiar and stereotypical, which leaves just enough room for the viewer to get unconsciously implied, complete the scene and relate to it quite intimately. Exhibition photo, by MJ Orihuela. Tracing Memory is an outstanding photography exhibition that takes us to the University Museum of the neighbouring city of Pamplona. Aitor Ortiz’s work is twofold: on the one hand shows sheer excellence in architecture photography as we know it, on the other, there is a less linear and quite unique personal exploration.